I originally posted this way back and figured what a perfect day to re-post. This has become my go to Greek Salad and Salad Dressing when I want to make it at home. I of course love anchovies and feel free to put in there. I didn’t have any whole garlic cloves so I used garlic powder and you know what? it worked out just right. If you’d prefer to use chopped fresh garlic go right ahead. I am going to give you ingredients from tonite’s dressing because it tasted just right. This is salad , so please feel free to substitute and leave out whatever you don’t like and add in whatever you like. Joel only eats the lettuce and cheese, I ate all of the other ingredients. I like to chop up a grilled piece of chicken and add in or a piece of salmon if you’re looking to make this more of a meal. Enjoy! 1/2 head of iceberg and 1 whole head of romaine (you can use less lettuce and you’ll just have a little more dressing left over depending on how you like it) you can also use all iceberg or all romaine, I like the combo. Mix spices and red wine vinegar and then slowly whisk in the olive oil, when you’re ready to serve pour over salad and mix. Add as much as you’d like. This dressing should dress the whole salad depending on how light or heavy you like your salad dressed. Enjoy! this is a perfect meal with fish or chicken or any protein you like. I put it on top of chicken and it was really good. Sort of a spin on Chicken Milanese Greek Style. 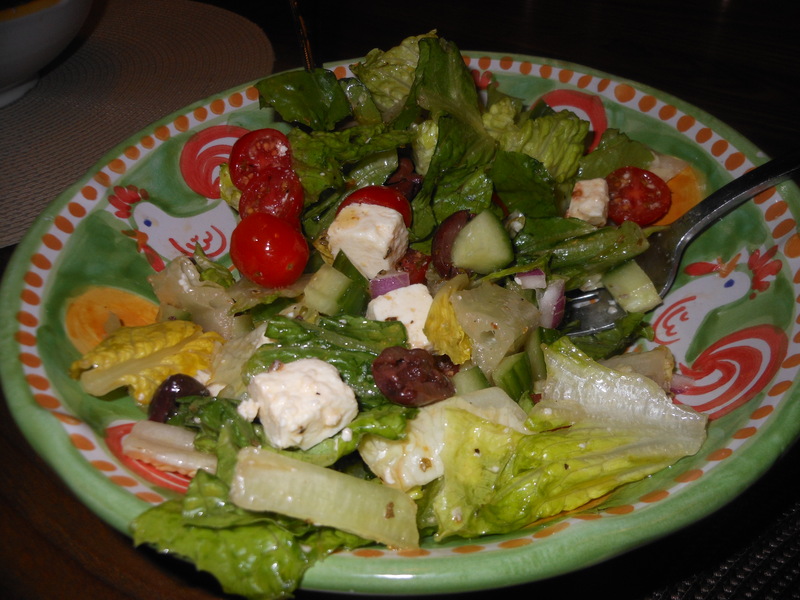 This entry was posted in Raw, Salad, salad dressing, vegetables, vegetarian and tagged Greek Salad Dressing. Bookmark the permalink. reblogging this recipe because I will be making it tonite! going to bbq some ribs and wanted to make this salad along with it!